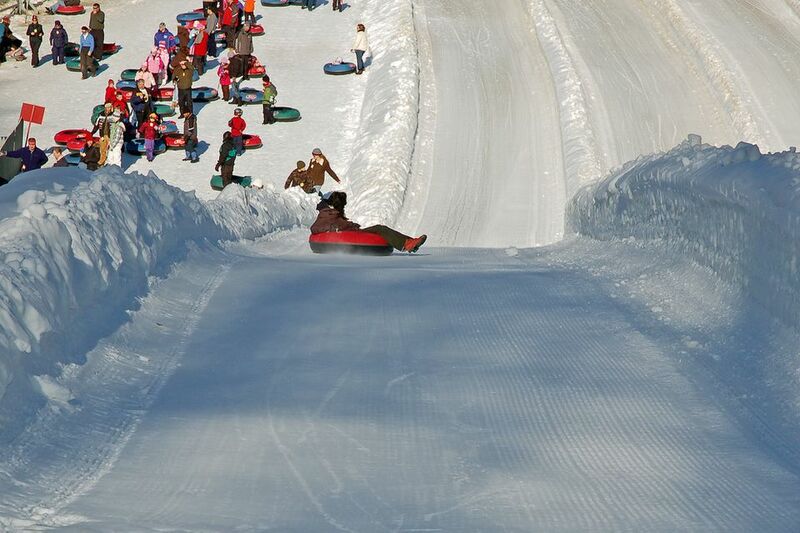 Snow tubing in New England is a thrilling winter activity that is a perfect alternative for non-skiers. Want to try snow tubing with your family? One of the best places to head for a fun-for-all-ages snow tubing experience is the eight-lane Ski Butternut Tubing Center in the Berkshires of western Massachusetts. Of all the winter fun activities in the Berkshires, flying down this tubing hill may prove to be your most memorable experience. Ski Butternut is the sort of intimate, small mountain that appeals to families, but let's face it: Skiing and snowboarding aren't for everyone, and the costs can add up quickly. Tubing, on the other hand, is an exhilarating and comparatively safe and affordable activity that requires no instruction, and the only gear you'll need—a snow tube—is provided. Hanging out in one of the ski area's two lodges, sipping cocoa and munching on homemade waffles (available weekends and holidays) can still be part of your experience, too. And you'll have energy left over for a visit to one of the Berkshires' other family-friendly attractions, such as the Berkshire Museum or the Norman Rockwell Museum. These tips for your outing will help you get the most out of riding the snow tubing hill at Ski Butternut. Save Time: Before you leave home, print out copies of the Ski Butternut Tubing Release and Assumption of Risk Agreement and complete them in the warm comfort of your home or car, rather than at the Tubing Center ticket window. Arrive Early: Ski Butternut's tubing facility opens at 10 a.m. on most weekends and holidays and at 5 p.m. on Friday nights. By 11:30 a.m. on weekends and holidays, it can already be difficult to find parking near the Tubing Center, and you may have to wait for a snow tube. Lines to obtain tubes can be even longer by mid-afternoon. Get Your Tube First: Don't make the mistake of queuing up at the ticket window before you snag a tube. On busy days, you need to be aggressive on arrival and wait at the bottom of the tubing hill to get your hands on snow tubes as they become available. Bundle Up: Jackets, scarves, hats and gloves are a must, even on a seemingly warm day. Snow pants, however, aren't really necessary: You can wear jeans and not really get wet. Keep in mind that it can be distinctly cooler in the Berkshires than farther south or east, plus, the ride down the tubing hill is quite a chilly thrill. That said, you'll feel coldest while standing around waiting to acquire tubes. Consider a Helmet: While helmets are not required, they may be a good idea, especially for younger children. While there are no formal age requirements for snow tubing at Butternut, children must be able to comfortably and safely ride in their own tubes: They are not allowed to ride on a parent or other adult's lap. Bring children's bicycle helmets along just in case you feel concerned. Wipeouts and dangerous activity are not common. You know your children best, however, and might want to consider a helmet, particularly for their first tubing experience. Go Before You Go: The facilities near Butternut's Tubing Center are limited to porta-potties (brr! ), so you may want to use restrooms elsewhere, such as at the Lower Lodge, before you head for the tubing hill. Bring Cash: You can use a credit card to pay for your tubing tickets ($25 per person for a two-hour session as of 2018/$10 for three hours on non-holiday Friday nights), but it's still a good idea to have a few bucks on you. There's no place near the Tubing Center at Ski Butternut to duck inside and warm up, so when your kids start clamoring for hot cocoa and snacks, which are sold at the ticketing building, you'll want to be able to pull out a few dollars. Be Prepared to Climb: One of the beauties of tubing at Ski Butternut is that the handle lift makes it easy to ride back up the hill in your tube between runs. That said, the tubing lift isn't the speediest thing in the world, and on busy days, a long line forms. If you want to maximize your tubing time, you'll probably find yourself trudging up the hill—instead of riding—most of the time. Hold On to Your Tube: When you reach the top of the tubing hill, place your tube's tow strap inside the tube, then be sure to hold onto the handles as you push off. In general, visitors respect the rules, particularly waiting in line and allowing the person in front to reach the bottom of the hill before starting out. You also need to hold onto your tube between runs: Don't walk away from it, even for a moment, or someone who's been waiting for a tube is likely to grab it. Go Faster: Your first run down the tubing hill may take your breath away, but after that initial exhilaration, the experience is sheer fun: not scary at all. If you're an adrenaline junkie, you'll find that the lanes in the shade to the far left of the hill as you look up are fastest. And here's another speed tip: Lift your bottom up out of your tube, and you'll have more momentum.